Another day, another round of Russian sanctions. 1. EU issues more sanctions: The European Union has announced tougher sanctions against Russia, preventing key energy and defense companies from raising finance in Europe. It has also added 24 names to its list of individuals facing travel restrictions and asset freezes. The U.S. government said it would follow suit with another round of sanctions Friday as Western nations attempt to pressure Russia to forge a peaceful resolution to the separatist crisis in Ukraine. "The new EU sanctions introduced today certainly take things to a tougher level," said Sunny Mann, a partner at law firm Baker & McKenzie. "At the same time, there is a signal that the EU is prepared to roll things back if the current crisis is de-escalated." Russia is reportedly considering retaliating by capping imports of Western cars and clothing. 2. 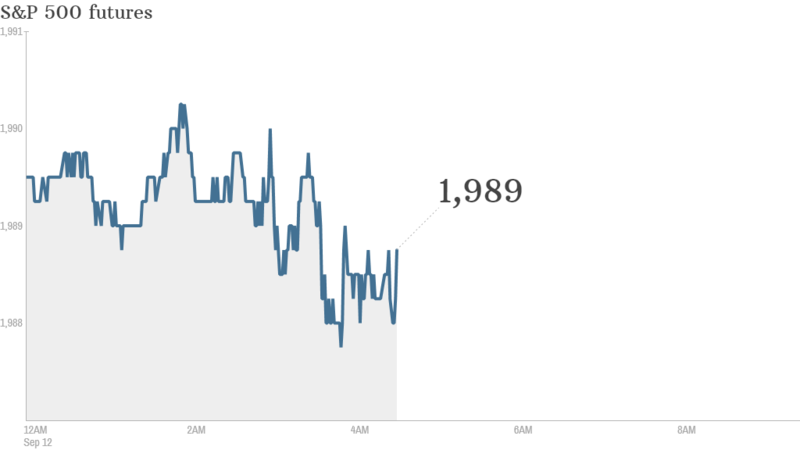 Markets unfazed: U.S. stock futures were relatively unchanged from their Thursday closing levels. European markets were slightly weaker. Investors had been expecting these new sanctions for over a week, hence the muted market reaction. Markets in Germany and France were down by about 0.3%. Meanwhile, Russia's main stock market index was rising by about 0.7%. 3. Economic announcements: The U.S. Census Bureau will report August retail sales at 8:30 a.m .ET. The University of Michigan will post its monthly consumer sentiment index at 9:55 a.m. ET. 4. Earnings: Darden Restaurants, (DRI) which owns brands including the Olive Garden and LongHorn Steakhouse, will report quarterly earnings before the opening bell. 5. Thursday market recap: U.S. stocks closed mixed Thursday. The Dow lost 20 points, but the S&P 500 and Nasdaq both closed 0.1% higher.